Raising chickens is a lot of fun and is growing in popularity across the nation. More people are raising chickens now than ever before but unfortunately chicken keeping comes with a bit of a learning curve. Oh sure there are books and blogs and informational groups and sites, but with so much (often opposing) information, how do you know which is right? Many people decided to start raising chickens for eggs then realize that chickens have unique personalities and quirks. Chickens become like family pets. They're kind of like dogs or cats, no two are exactly the same. Unlike dogs or cats though, there are very few vets that specialize in them. Like any loving pet parent, chicken keepers worry about the stuff they can't control with their animals. Predators: No surprise here, chicken predators are the number one fear chicken keepers face daily. From the neighbors dog to bobcats and even bears, everything likes to eat chicken! Your best line of defense is always going to be a secure coop and run. Many people keep a guard dog with their chickens especially if they choose to free range them. I've spent a lot of time inspecting and fixing coop and runs to keep my chickens safe from predators. It's an ongoing battle because predators are always looking to get in! Here is an excellent tutorial on How to predator proof a coop from Our One Acre farm. The chickens are going to die: one of a chicken keepers biggest fears is that the chickens are going to get sick and we won't know what to do. Let's face it, there are a lot of illnesses chickens can get and none of us start out an expert! You can't just take chickens to the vet like you would with other pets. They need a special avian vet and those are often hard to find, not to mention expensive. Most chicken keepers learn about poultry illnesses online and through books. I did a lot of research through chicken forums when I was starting out, but since posting on forums result in answers from many people (who may not actually know the correct answer) you need to sort out the good from the bad. Chicken blogs like this one are a good source of information, though you need to be careful to take advice from those who have actual experience with an illness, not just someone regurgitating information they found online. I like this article on chicken illnesses from You Should Grow that was written by a vet. Cost: Chickens are not cheap, and many chicken keepers fear that they will get too expensive to keep. Everything from coop replacement, an avian vet visit or even skyrocketing feed and bedding costs can affect our ability to keep chickens within our budget. I've made it my personal mission to figure out how to keep chickens as cheaply as possible and managed to cut my feed costs in half. Not be able to care for them myself: Whether it be failing health of the chicken owner or just a crazy work schedule, many chicken keepers fear not being able to take care of their flock properly. Most chicken owners like to do things themselves so handing over the chores to a family member is nerve wracking! Taking the time to thoroughly teach someone in the proper way to feed, water and care for your flock can go a long way towards alleviating this fear. Writing and printing out instruction sheets (like this one) to keep on hand is a good idea. If a situation should arise where you cannot get back to your flock, you'll be more at ease knowing someone can help out and know what they're doing. Having to move: Having to move and find a new place that allows chickens was a big worry for some chicken keepers. Not all zoning allows for roosters or even hens. Even if you own your own home, issues can arise and a move may be in order. Once you find a place though, the chickens still need to be transported to their new home. Fresh Eggs Daily moved across the country with her chickens and it worked out perfectly! It's possible to move with chickens, just not as easy. Noise: Many chicken owners live in an area where roosters are not permitted because of a noise ordinance. Once you actually start raising chickens you realize that hens have a noise all their own....and it can be really loud! Even if you do live in an area that allows roosters, nobody really wants to annoy their neighbor and roosters are pretty good at doing just that. Actually, guineas and peacocks might be better at it than roosters, but they all can present a problem if everyone around isn't on board with the idea of poultry in the neighborhood. I got past this with my neighbors by explaining the benefits of having guineas around and how they would help our tick problem. Thankfully, they gave it a chance and the guineas did help reduce ticks! Not being able to go away/vacation: Some chicken keepers don't even want to be gone for more than a few hours! While this was close to the bottom of the list of fears, many people don't like the idea of being homebound just because they have chickens. Unfortunately you can't just kennel them or take them to stay at grandmas like with a cat or dog. Going away when you have chickens requires a plan and some advanced notice. 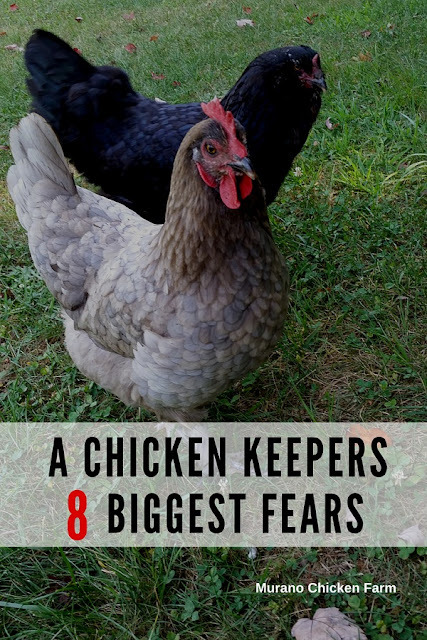 These were the top 8 problems chicken keepers fear the most from the people I polled....but now I'm curious, what are your top chicken fears? Want information on raising chickens sent right to your email weekly? Click right here to join my list and get new posts sent directly to you the day they're published ... plus, you'll also get the free download '25 Ways to save money raising chickens'. How I make $1,000 a month from 15 chickens! Copyright 2010-2019 Murano Chicken Farm. All rights reserved.. Powered by Blogger.